The working demo can be found on Heroku. Today, let’s implement a “Load more” button instead of an infinite scrolling. This solution may come in handy when, for example, you have some links inside the footer and infinite scrolling causes it to “run away” until all the records are loaded. Now there are two independent pages that demonstrate two concepts. For the most part, the view is the same. I’ve only changed the identifier of the pagination wrapper (we will use it later to write a proper condition) and added a #load_more_posts block that will be displayed as a button with the help of Bootstrap classes. We want this button to be shown only if there are more pages available. 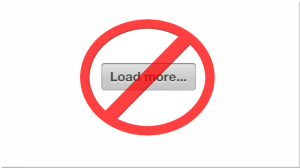 Imagine a situation when there is only one post in the blog – why would we need to render “Load more” button? Here we are hiding the pagination block, showing the “Load more” button instead, and binding a click event handler to it. Also, the loading_posts flag is used to prevent sending multiple requests if a user clicks the button more than once. Inside the event handler, we are using the same concept as before: fetch the next page URL, add a “loading” image, disable the button, and submit the AJAX request to the server. We’ve also added a callback that fires when the response is received. This callback restores the button to its original state and sets the flag to false. Again, we are appending new posts to the page. If there are more posts, a new pagination is rendered and then hidden. Otherwise, the pagination button is removed. Now you know how to create infinite scrolling or a “Load more” button, instead of a classic pagination. One thing that you should probably consider is, how can a user share a link to a particular page? Right now, there is no way to do this, because we do not change the URL when we load new pages. is not reloaded. However, there is a third, and more elegant, solution – the History API. With this API, we can directly manipulate the browser’s history. In this particular case, we want to add some entries to the history using the pushState method. First of all, let’s download the History.js library by Benjamin Arthur Lupton that provides cross-browser support for the HTML 5 History/State API. For jQuery you will probably want to use the script located under scripts/bundled/html4+html5/jquery.history.js. Do not forget that more_posts_url contains a link to the next page, where the page number is fetched. Inside the pushPage function we use History.js to manipulate the browser’s history and, basically, change the URL (with the last parameter). The second parameter changes the window’s title. The first parameter (null) can be used to store some additional data, if needed. Please note that, after the URL was modified, a user can click the “Back” button in his browser to navigate to the previous page. Pretty cool. The last thing to worry about is the legacy browsers: IE 9 and less to be specific, which do not support the History API. In these archaic beasts, the resulting URL will look like this: http://example.com#http://example.com?page=2 instead of http://example.com?page=2. So, we have to add support for this case. This block of code runs on page load. Here, we scan the url hash for page=. If found, the search portion of the URL is updated with a corresponding page number and after that the page is reloaded. This solution, however, leads to a problem where the user cannot load previous posts. You could implement a more complex solution with a “Load previous” button or just display a “Go to the first page” link. Another way is to combine basic pagination, displayed at the top of the page, along with infinite scrolling. This solves another problem: What if our visitor wants to go to the last or, say, the 31st page? Scrolling down and down (or clicking a “Load more” button 30 times) will be very annoying. We shoule either present a way to jump to a desired page or implement some filters (by date, category, view count etc). Inside index.js.erb we do not modify the 2nd line because we want pagination to update in both places. The same concept applies here. Also, note that in both cases I have moved the replaceWith out of the conditional statement. At this point we want our pagination to be rewritten every time the next page is open. If we do not make this change when the user opens the last page the top pagination will not be replaced – only the bottom one will be removed. We’ve reached the last, and probably the trickiest, part. At this point, we update the URL and highlight the current page when the user scrolls down and more posts are being loaded. However, what if our user decides to scroll back (to the top)? Of course, neither the URL nor the pagination will be updated and it can be rather confusing! This can be solved by implementing scroll spying. Our plan is as follows: add delimiters between posts from the different pages (those delimiters will contain page numbers) and raise an event whenever the user scrolls by these delimiters. Inside the event, check which page he is currently viewing and update the URL and pagination accordingly. Lets start with the delimiters. Here the data-page contains the actual page number. We either fetch it from the GET parameter or set to 1 if no page number was provided. Notice the first-page class that we will use shortly. We also have to update the scripts. Right now these delimiters will be invisible to the user. Lastly, implement the actual scroll spying. For that we can use the Waypoints library for jQuery, created by Caleb Troughton. There are some other libraries that provide the similar functionality, but this one allows tracking whether the user scrolled up or down, which will come in handy in our case. The following function will attach an event handler to the delimiter which fires whenever a user scrolls to it. Unfortunately, as our delimiters are being added dynamically we will have to attach this event to each one separately, otherwise Waypoints won’t work. Here, the code checks that the user is not scrolling up and has not reached the first page. Then, it fetches the page number from the data-page attribute and decrements it by 1 if the direction is up. This is because our delimiters are placed before the posts from the corresponding page, so when the user scrolls up and passes by this delimiter he actually leaves this page and goes to the previous one. The #static-pagination selector points to the block with basic pagination. It returns the li element with the current page number and assigns an active class to it (removing this class from another li). Note that page numeration starts from 1, whereas indexing of the elements that are being returned by $('#static-pagination li') starts from 0, yet we do not decrement the page by 1. This is because the first li in the pagination block always contains the “Previous page” link, so we just skip it. Lastly, we also change the hash in the URL. Also note that the preparePagination function is attached to the window. This is so we invoke it not only from within this file, but from our *.js.erb views as well. CoffeeScript wraps the code inside each file with self-invoking anonymous function to prevent polluting the global scope (which is actually a good thing). In this case, though, if we don’t attach the function to window, it will be invisible from the outside. Now, we can apply it. The last important thing to do is to remove the $(window).unbind('scroll'); from index.js.erb, because Waypoints relies on this event and we should listen to it all the time. its opacity will be set to 1. This brings us to the end of this article. I hope you’ve found some useful tips while reading it. Presented solutions are not ideal, but should give you an understanding of how this task can be accomplished. Please share your thoughts about this article, along with any ways you have solved the problem with loading previous posts on your website.